Once again Treehouse Brand Stores and Bethesda have sent us another edition for unboxing and review: Wolfenstein The New Order Panzerhund Edition. This edition is of the high quality we’ve come to expect from Treehouse: packed extremely well for shipping, the edition itself comes in a very high quality box with great attention to detail, and externally sealed with a visible number plate. Inside the box is a host of well made items including an exclusive G2 SteelBook and a Panzerhund model that comes hand painted with 30 points of articulation (I counted after the unboxing). Shipping on May 20th and Limited to only 5,000 units. Astonishingly this is still available (at least right now). Sold exclusively through the Bethesda Softworks online store at a price of $100. Once again Treehouse Brand Stores has sent me an item for review: The Hero’s Guide to the Elder Scrolls Online. A special package consisting of 3 book created in conjunction with Dark Horse Comics. This item is very well made and is limited to only 10,000 units and sold exclusively through the Bethesda Softworks online store at a price of $100. 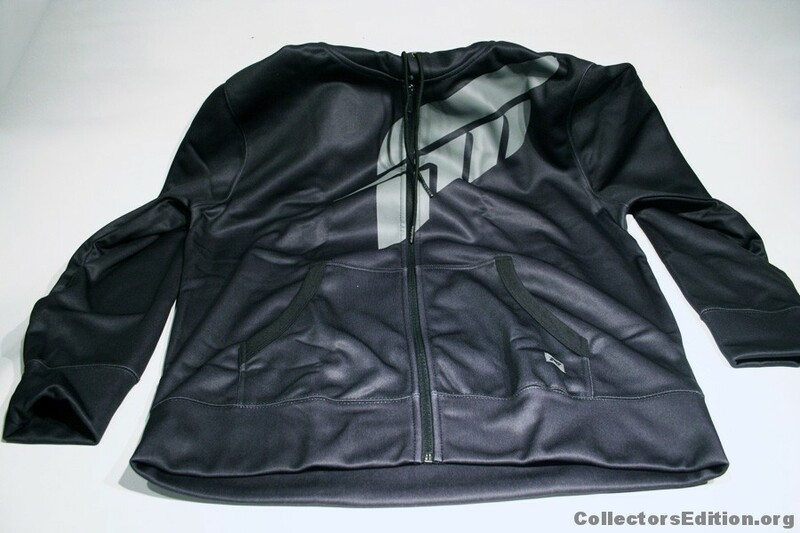 You can win this item for yourself by signing up for the forum and leaving a reply to this thread. Or you can win if you like and share this post on Facebook. A winner will be selected and notified on May 3rd. Update: The Winner has been chosen and contacted. 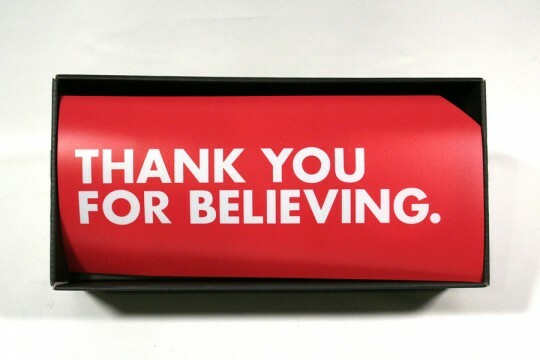 Thank you, everyone, for playing and stay tuned as we will be doing another give-away soon! Recently I was contacted by Treehouse Brand Stores; the company that handles special packaging and merchandising for many major video game brands. 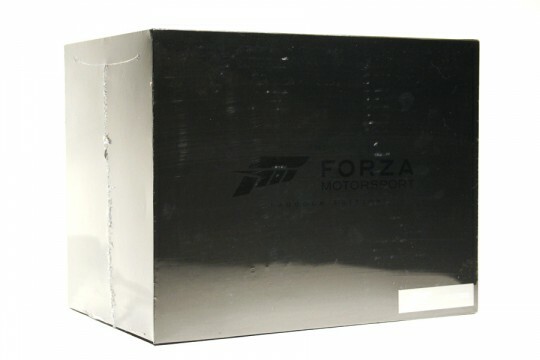 They liked the unboxing article I wrote about a major release of theirs earlier this year, the Dead Space 3 Dev Team Edition and wanted to send me a copy of the upcoming Forza Motorsport 5 Paddock Edition a week before it’s official ship date on November 20th. While I’ve never played any of the Dead Space games I am an avid automotive enthusiast, and a very big fan of the Forza series, so I jumped at the chance to check it out early. I even opted to shoot the first ever official CollectorsEdition.org unboxing video which you can see below. The video shows my initial impressions of all the included items, since then I’ve been able to give all of the items a closer look and organize my thoughts on this edition. 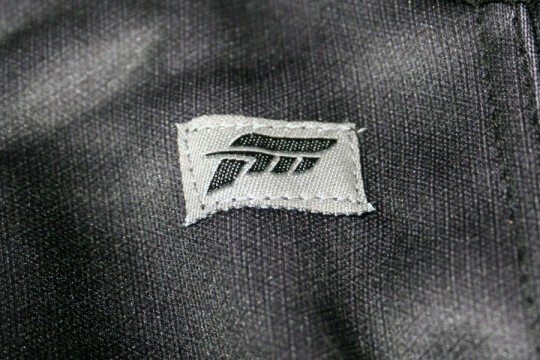 The Forza Motorsport series seems to have a history of outdoing itself with each new edition. 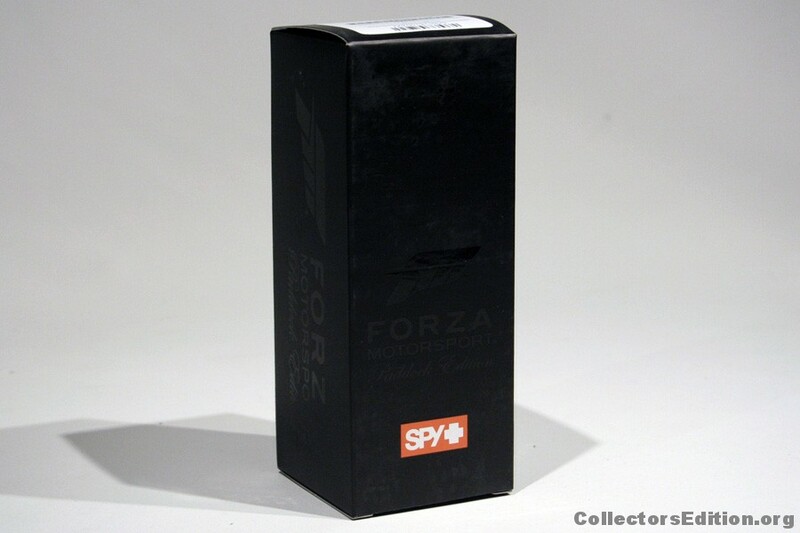 The first game didn’t even have a Collector’s Edition, Forza Motorsport 2 had a nice art-box with a heavy booklet on the various cars and driving techniques, Forza Motorsport 3‘s packaging took it a step further with a felt lined display box and included a high quality key-chain and metal cased thumb-drive with extra content and Forza Motorsport 4 as well as Horizon stepped up even further and included everyone’s favorite bonus, a Steel Book game case. 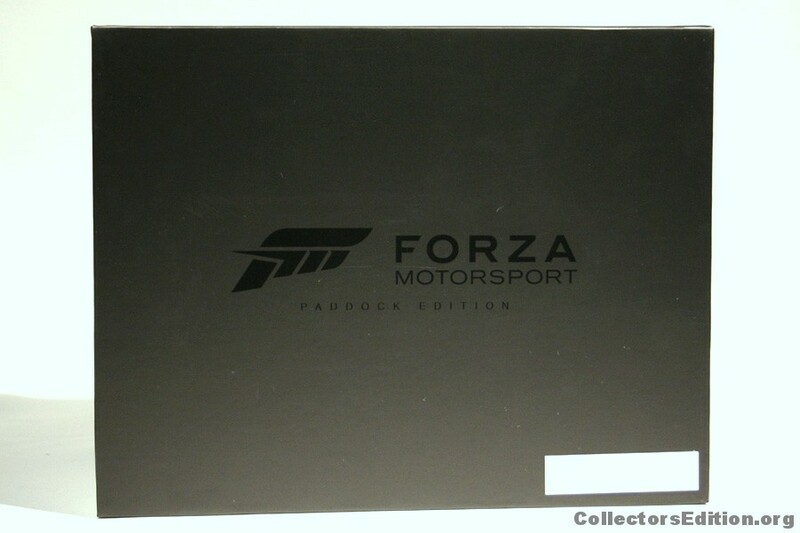 Taking it even further, this time around we’re getting two different editions for Forza 5, the Limited Edition and the Paddock Edition. 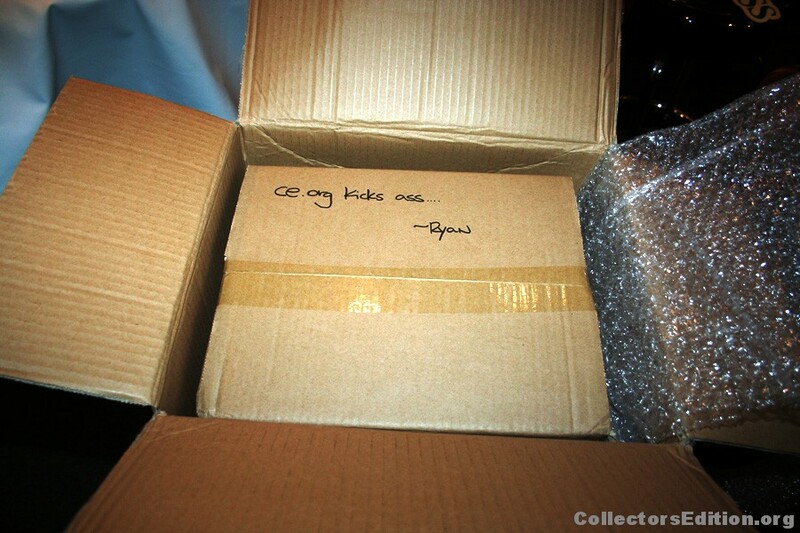 One of the things that every collector fears is shipping damage. 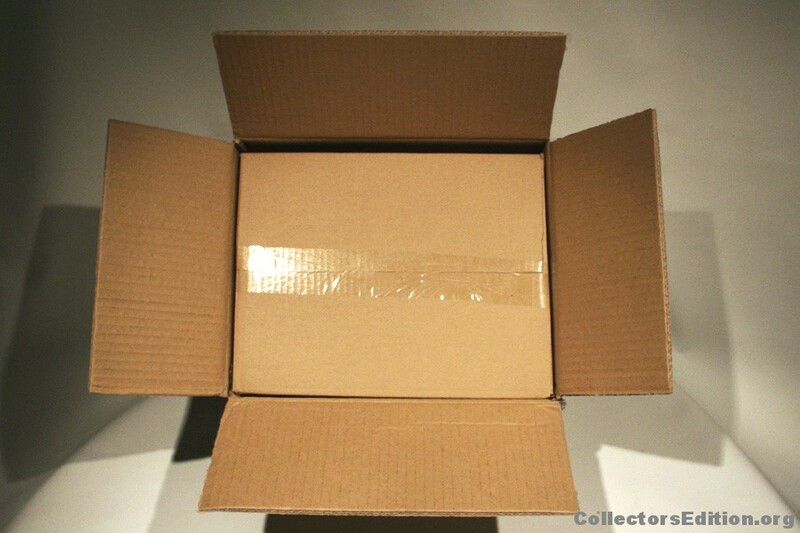 Unlike most things you buy where the packaging is just husk that gets discarded on your way to the good stuff, the box is the most important item to a collector. When you’re having your expensive new CE shipped then the packaging is vital to ensuring that it arrives without any blemishes. I was very happy to see that the Paddock Edition arrived to me triple boxed. Based on the labeling I would suspect that most orders will be sent with at least 2 boxes. This is a good step in the right direction. There are a lot of stores that could deal to better package their items, I’m sure more collectors wouldn’t mind spending a little extra to ensure that their CEs are packed well. This edition, like the Dead Space 3 Dev Team Edition, does not include the game. Personally I’m not much of a fan of this trend, I feel like no video game CE is truly completely without also including the actual game. Unfortunately I fear this might be the way of the future with more and more titles moving to digital distribution methods. With the Xbox One having been designed to fully support digitally distributed games this might very well be the harbinger of CEs to come. 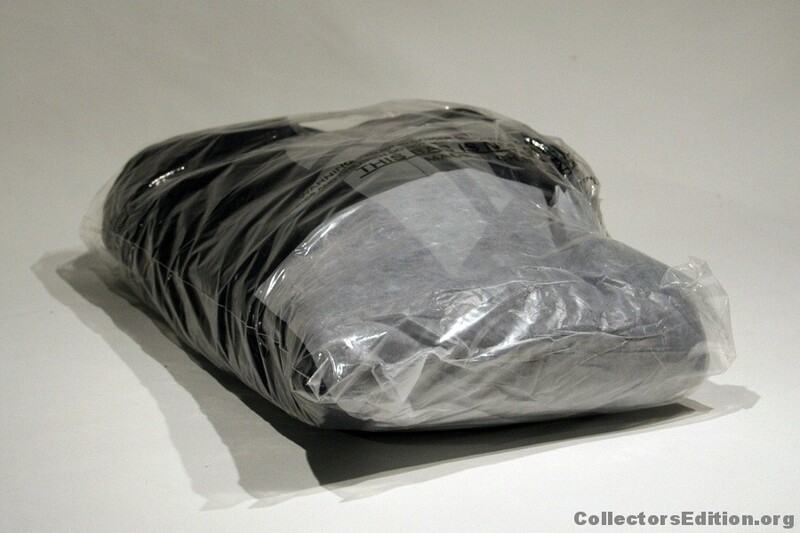 The package itself is fully sealed in cellophane, which will be be greatly appreciated by sealed game collectors. This is also a numbered edition, only 3,000 of these will be produced world-wide and the metal tag with your serial number is displayed right on the front of the box under the wrapping. This is also great for collectors who would like to know which number they have without having to open up the box. I didn’t really mention it in the video above but the box itself is incredibly sturdy. It’s made out of a very heavy chip-board material similar to the box used by the Bioshock 2 Special Edition. If you’ve read some of my CE opinions before you’ll know I consider that game to be the hallmark of properly designed CE boxes. The lid of the box is held shut with magnetic clasps, which is fantastically slick and something I think a lot more CEs need to make use of. The package design itself is simple and sleek. 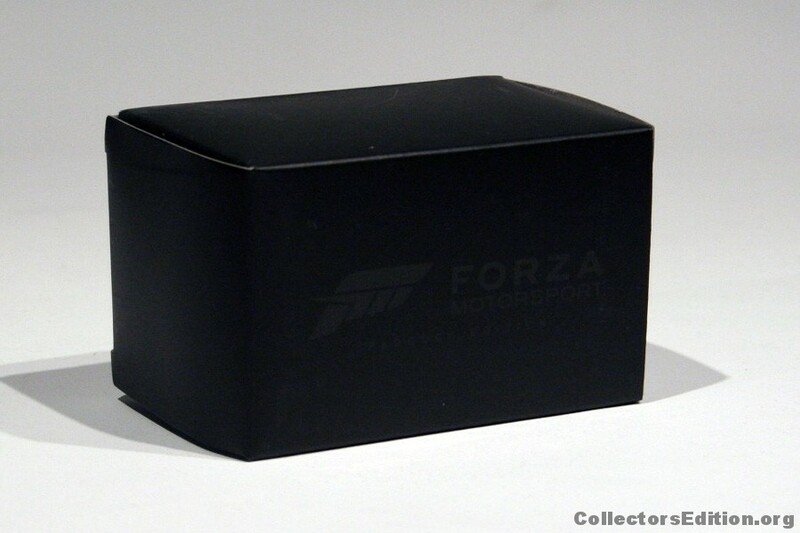 It’s a plain matte-black box with a simple contrasting gloss black logo. 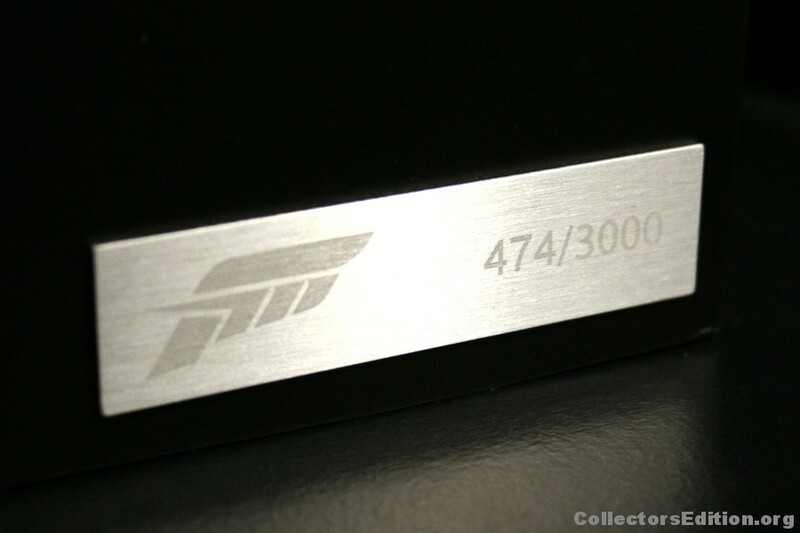 The only other adornment on the box is the brushed aluminum serial number placard. The fact that the box uses a heavy and sturdy material instead of some flimsy cardboard makes this work. All the sides are perfectly flat, and all the edges are sharp. The minimalist matte-black look wouldn’t have worked nearly as well with wavy or bulging cardboard. One thing I really love about this edition is that it’s all about presentation. The outer box design is simple and deliberate, opening the lid is a simple process unabashed from futzing with some kind of locking cardboard flap and once the lid is open you’re presented with a layer of content. All faced properly and all marked with matching logos. 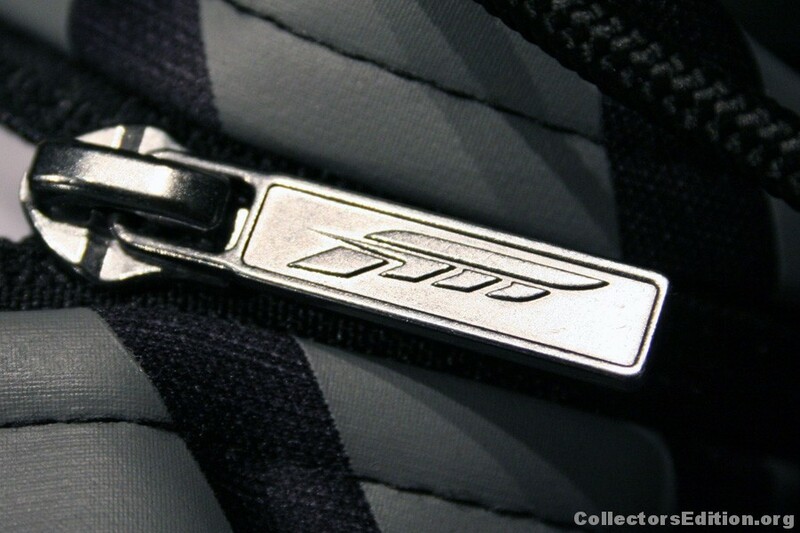 It’s the kind of details that you really only get with a very high end product. I recall being disappointed with the items presentation in the Dead Space 3 Dev Team edition because it boiled down to items in a box without any real care taken to consider presentation or the experience of unboxing the items. The one minor disappointment here was that the items under the flap had clearly been rubbing up against the lid and as such were a little scuffed up, this might not normally have been a problem but the matte black finish on the smaller boxes seemed highly susceptible to wear. The first item you’ll see is the water-bottle. This is made of a really light weight stainless steel and is covered with the same gloss black logo on a matte black finish as the rest of the CE. 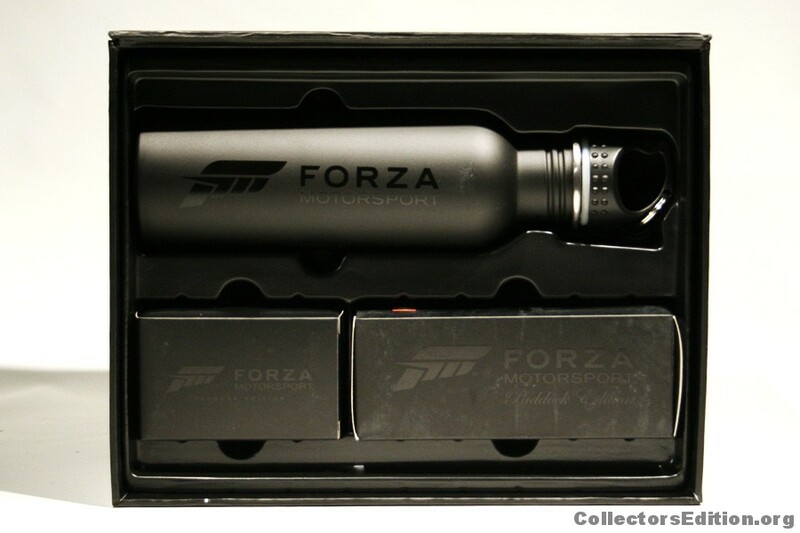 It’s a really nice looking piece and probably the nicest water bottle item I’ve ever seen in a CE. The scuffing from the lid I mentioned earlier didn’t seem to hurt the bottle at all, what little blemish there was wiped right off. 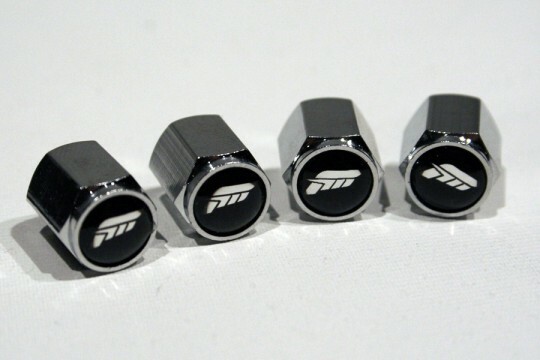 The smaller of the two boxes contains a Forza Motorsport logo key-chain as well as a set of logoed valve stem caps. The key-chain is really nice. I have to say I personally enjoy editions that include a high quality key-chain where it’s appropriate. This one does not disappoint, it’s a heavy, high-quality, piece and follows the minimalist design trend of the rest of this edition. 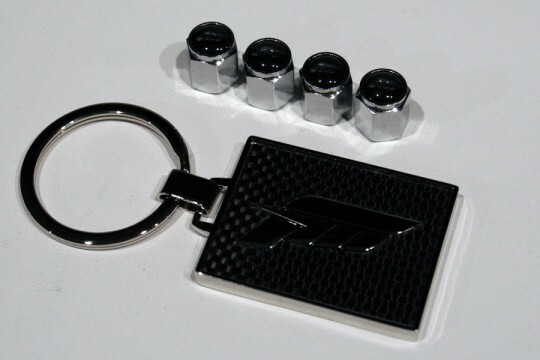 The design would fit well to accessorize any sports car and isn’t some obnoxious marketing trinket that you’d typically get with a key-chain like this. The valve-stem caps are one of my favorite inclusions with this CE. I mostly appreciate them because I can’t think any other CE that has ever included an item like this. They’re not cheap plastic caps either, they’re made of a zinc alloy and even include a rubber seal to further help keep debris out of your stems. The logos are again, simple. Normally I would consider an item like this kind of cheesy but I think it might make a neat detail to put on a modified car that wouldn’t be as overbearing as say, a sticker or vinyl. I have to admit, I’m tempted to run them on one of my own cars just as a fun sort of easter-egg for those who give it a closer look. 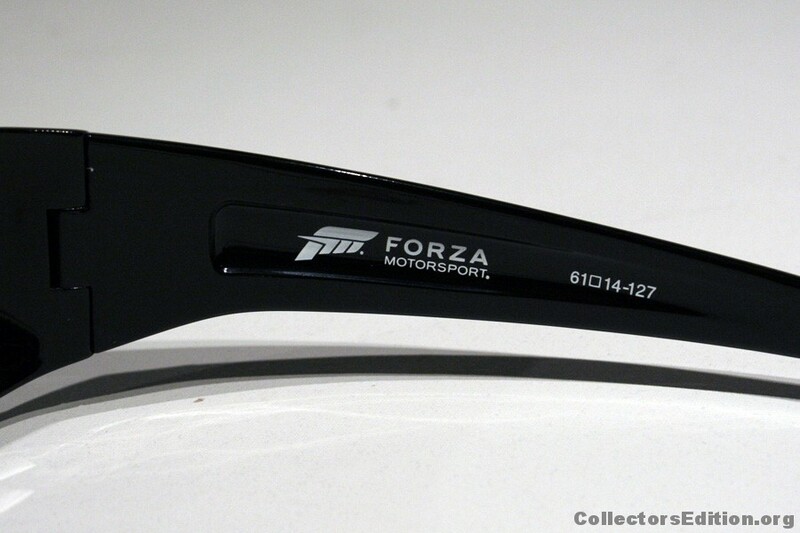 The included sunglasses have two Forza logos on them. there is a small logo printed on the inside of the right stem. 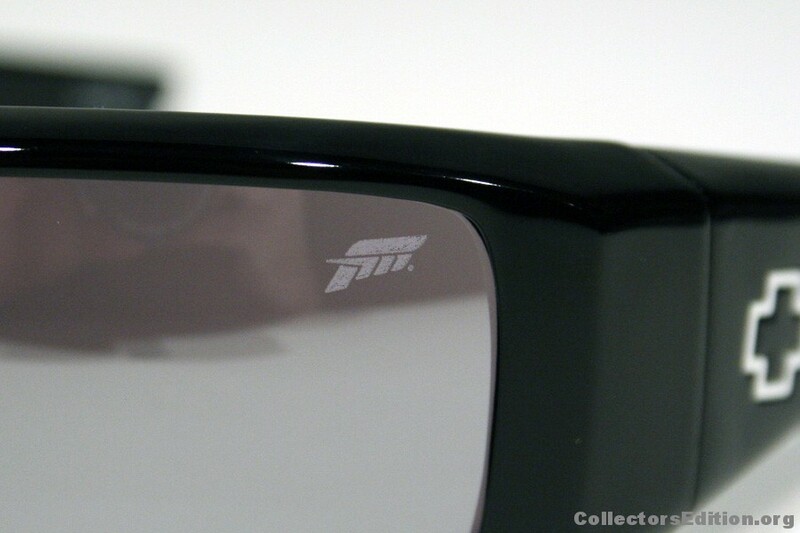 and another small logo printed in the upper corner of the left lens. The lens logo (the only outward logo) is so subtle that I didn’t even notice it when I initially took it out of the box. What was very clear to me was that these glasses where a high quality name brand. The fit and finish of this piece is consistent with with a high end pair of glasses, not some cheap pair off the discount rack. I’ve since had an opportunity to research them further and the Spy Optics Logan sunglasses like these retail for $75 to $120. This is an important detail because that’s nearly the cost of this entire CE. If you were in the market for a pair of sunglasses you could buy this instead and host of really nice extras in the process. I don’t typically wear sunglasses, I have a single pair of RayBans that I received as a gift and use when I have need. In comparison to those I must say that I was really impressed with these glasses, the look fits well with the rest of the items in this edition and the quality as an item on it’s own is very impressive. 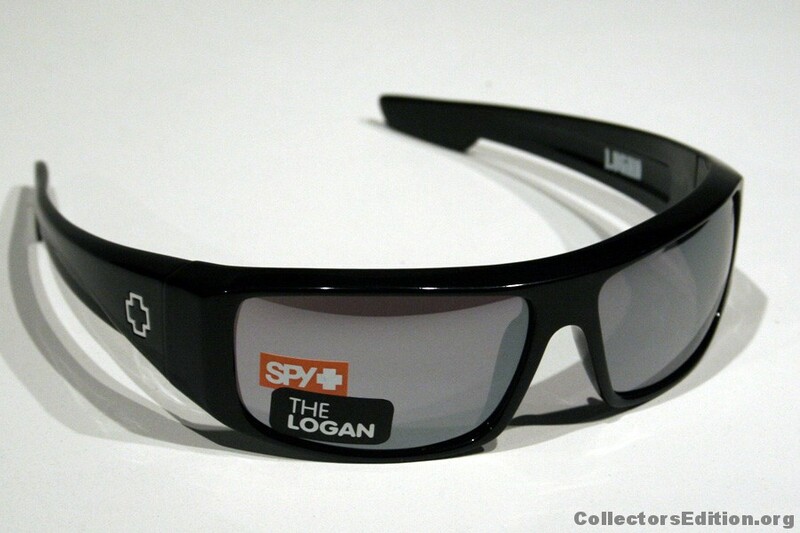 I’m actually torn between my desire to keep CE items preserved and actually replacing my current sunglasses with these. 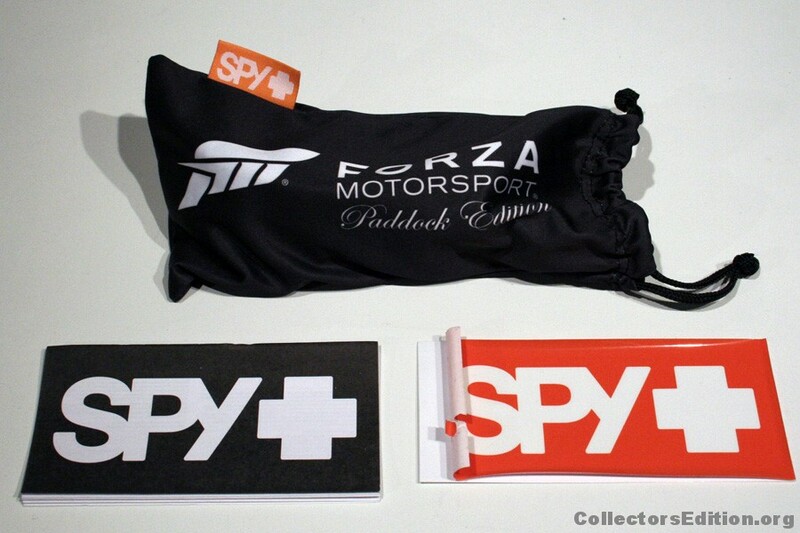 The glasses also include a nice Forza Motorsports Paddock Edition draw string bag. The only mild disappointment here is that the included Spy Optics sticker was had pealed back slightly and become stuck to the glasses bag. The sticker was essentially ruined, though this may have been a isolated case, and it was a non-essential item. 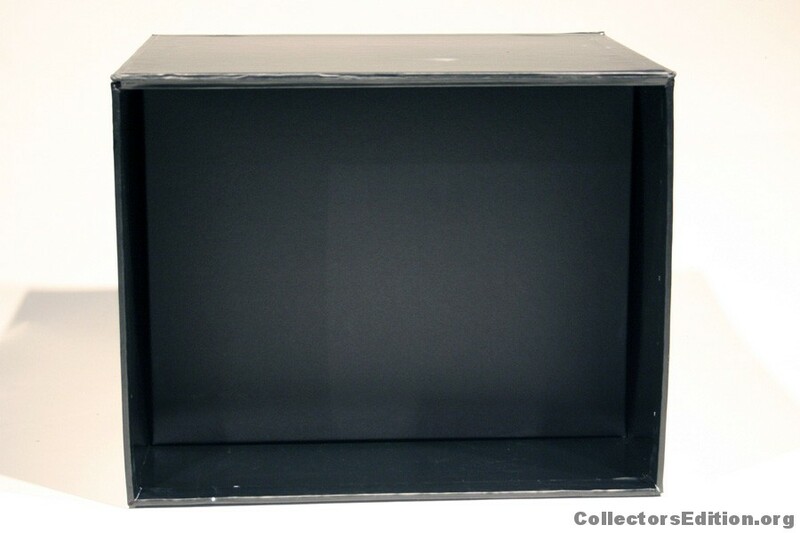 The final item included with this CE is hidden under a cardboard separator, which is hidden under the plastic piece that held the first three items. Removing packaging material like this certainly doesn’t add anything to the unboxing experience. However, the fact that they took care to simply and black out both of these pieces puts it head-and-shoulders above many other CEs that used plain, cheap, brown cardboard for the same purpose. Not every box can be full of ornate trap doors and item holders, and this is the next best thing without skyrocketing the cost of the packaging. The hoodie hidden beneath the cardboard comes in a fairly typical plastic bag. Again, not the prettiest looking package but unavoidable without if you wanted to keep the garment clean and sealed. A black plastic bag similar to how many limited edition t-shirts are sealed would have been a nice touch, but this is really a nit-pick. 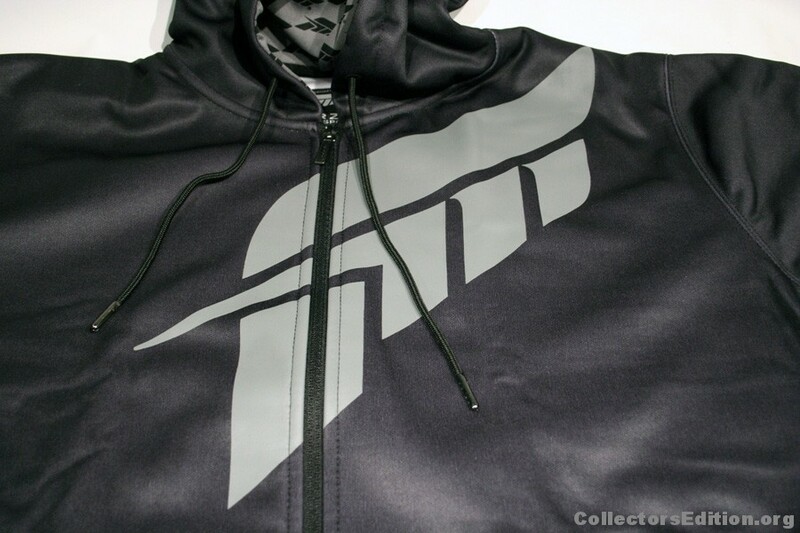 The hoodie is really the major selling point of this CE. Where a normal zip-up hoodie might run you $40 or $50 this one is consistent with the quality you’d get with an $80 to $100 hoodie. It’s also the loudest piece included with this CE. 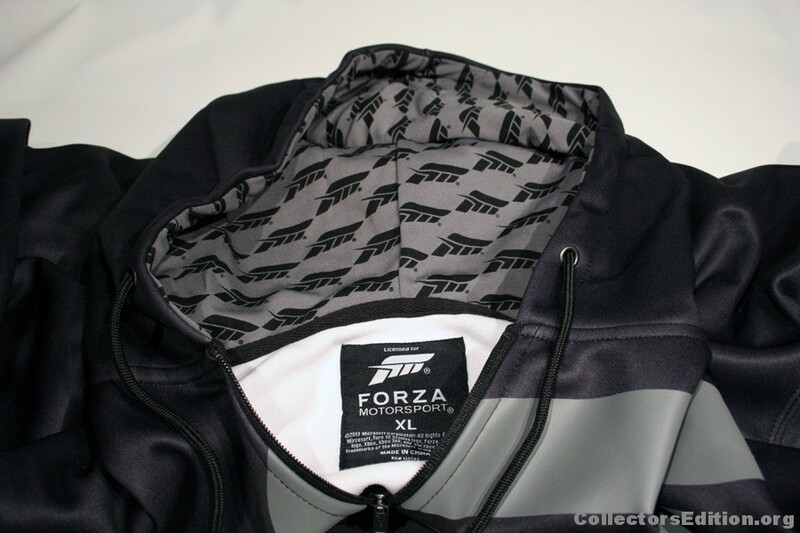 It has a big Forza logo across the chest, a smaller logo on the front left pocket, a logo on the zipper tab, a logo on the collar tag and a logo print on the inside of the hood. Even still, the use of subtle shades of black and gray help to tone it down. The materials used are very high quality the outside is slick and would likely shed water and wind fairly well, while the inside is soft. Overall it uses fairly thin material but this seems the kind of thing that would do better to help protect you from wind and rain as opposed to something you’d wear to keep you warm on your couch at home. 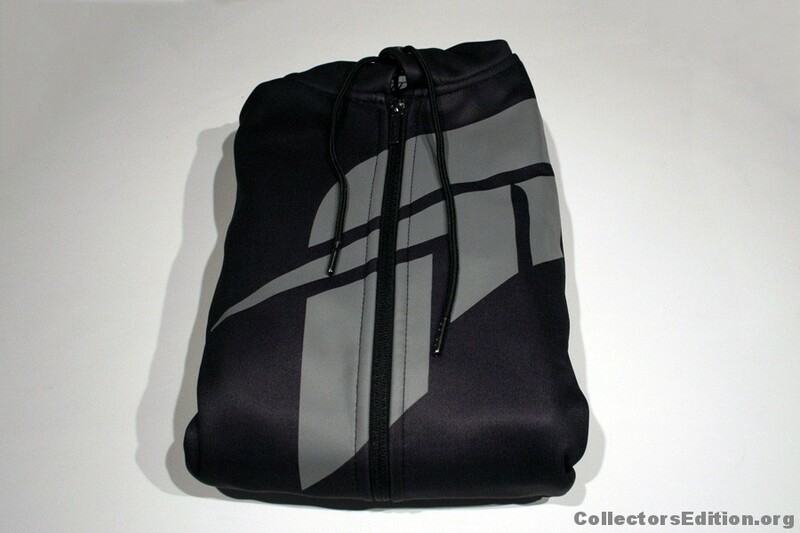 When ordering this CE you can choose the size of the hoodie you receive from Small all the way up to 3XL. I ordered an XL as that’s the size of all my other hoodies and t-shirts and I will say that based on typical American sizing this seems to run a little small so if you plan on wearing it i would recommend ordering a size larger than you normally do. I was on the fence about this CE when it was first announced. I’m a fan of CEs and I’m a fan of Forza but the included items didn’t initially excite me and I was apprehensive about the $120 price tag for a CE that didn’t include the game. My initial fear was that the items and packaging might be cheap, obnoxious, logo-riddled marketing pieces. However after having seen this edition first hand that’s not the case at all, it’s actually quite the opposite. Considering the quality and value of everything included it really is one of the best CEs I’ve ever seen. It hits all the right points and for all the right reasons. From a collector’s perspective, it comes sealed, it comes in a really high quality box, it has low production numbers, and it comes serialized with the number displayed right on the front of the box. From a an item quality and experience perspective it does exceptionally well, everything about this CE was well thought out and all of the included items are the kinds of things you might find or need on a real racing paddock. For those who like their CEs to include artifacts from the game, made real, this is as close as you can get in a racing game short of including a super car or a fire-suit. From a pure value perspective this CE really shines. The retail price of the sunglasses alone are as much as this entire CE. Considering the quality and cost of everything included you would spend easily twice as much to piece all of these items together individually and even then it still wouldn’t have come in a really nice box. Aside from a few small blemishes, my only real complaint is that it didn’t include a copy of the game. On a whole I think it’s a solid contender for one one of the best CEs in recent years and a damn good way to kick off the next console generation. I really hope that other collectors and Forza enthusiasts can see the value and quality of this edition, my fear is that they will have the same reservations that I did initially and will opt to pass on it, which would be a mistake. 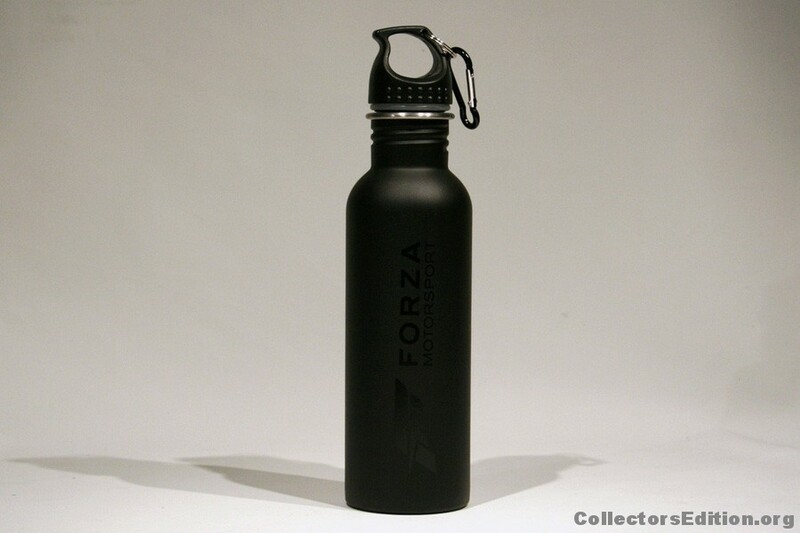 As of the time of writing this edition is still available through the official Forza Motorsport Store at a price of $120. The ship date is November 20th, 2013. Capcom posted up a video unboxing of the Dead Rising 2 High Stakes Edition due out next week. Most everyone I’ve talked to who has pre-ordered this edition recently received an email from Capcom stating that it is on back-order, including myself. I wasn’t too happy with the comment on the video of “… hopefully you got your copy.” does he know something we don’t? In this video Xbox Live’s Major Nelson unboxes a Limited Edition Red Xbox 360. While this isn’t anything we haven’t seen from the previously released pictures, it is interesting to note that these consoles will likely have the latest version of the internal hardware, “Jasper”.